I guess it’s about time we got stickers, right? 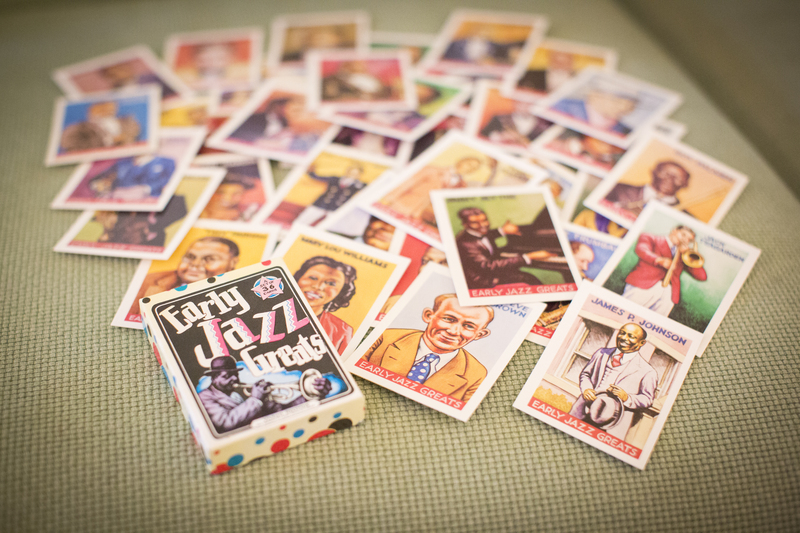 You can get them at our shows or you can email us at mintjulepjazzband@gmail.com to arrange for us to snail mail you a sticker or two – $1 each at shows or $1.50 by mail in the continental U.S. In December of 2016 we announced that a Mint Julep Jazz Band song would be a part of a compilation album called That New Old Sound, organized by our friend and bandleader Glenn Crytzer, where 100% of the proceeds would go to the American Civil Liberties Union. As of this July 4, 2017, the album has raised over $6,000 for the ACLU! If you haven’t already, pick up a copy of this great album, with 17 tracks from musicians all over the United States playing traditional jazz and swing music, and celebrate your right to listen and our right to perform this wonderful music. We’ve received many requests for specific merchandise and more tee shirts following our Battle Axe Kickstarter campaign – then a friend told us about Zazzle, which will handle the production and distribution of a wide variety of merchandise, we just select what we want to offer, create a store, and then create the merchandise to go in that store. Visit our brand new store on Zazzle.com to get logo tees (adult and kids), hoodie, bags, water bottle, onesie, button, earrings, magnet, compact, flask…and we’ll take requests for other items if Zazzle offers them! Enjoy! Wrap Us Up for the Holidays with 1 Cent Shipping! The fierce support staff at the Fidelitorium. With our new album out and not a lot of information that we’re able to fit on one side of a CD sleeve, we get questions about Battle Axe logistics, so here are some behind the scenes tidbits about the conception and creation of Battle Axe, accompanied by fantastic photos from our Sunday recording session taken by our documentarian in residence, Alexandrea Thomsen (aka dtownperspective). Conceptually, it is difficult to come up with a direction for a second album – we wanted to deliver a solid album of dance music, take some creative liberties, showcase a range of tempos, and keep everything fun. With the idea that there are many jazz albums whose cover art verges on lackluster or isn’t eye-catching, we wanted to do something cool. And when I say cool, I probably mean nerdy. Would I buy this album and/or be intrigued by the title/cover art? One of our local Triangle area dancers, Skyler Hinkel, is an avid video gamer and metal fan – death metal, pirate metal, folk metal, everything. He suggested that Mint Julep Jazz Band be a battle swing band and forge a new genre of swing music where all of our songs had something to do with battles. While the execution of a battle swing band would have been out of our reach in time for an album, the idea stuck and we decided, based on the Jimmie Lunceford tune in our book by the same name, to call the album Battle Axe and include some other conflict-oriented tunes. With this concept in mind and prior to recording, we announced the title of the album on our Facebook wall, which garnered a great response, including one from Ryan Lemar, a swing dancer and instructor in Richmond, VA, who suggested that all of our albums should be named after weapons and rattled off a list, including a trebuchet. Our tenor player, Keenan McKenzie, who is also a whiz on the soprano sax, took this idea and ran with it, writing an original tune called “Trebuchet” that is very much in the vein of something Sidney Bechet might have scribbled down – très Bechet, even! Keenan also wrote the original tune “The Dwindling Light by the Sea” and arranged “Say It Isn’t So,” “You Can’t Live in Harlem,” and Mussogsky’s “Night on Bald Mountain” (which he initially put together for a Halloween gig in 2014). 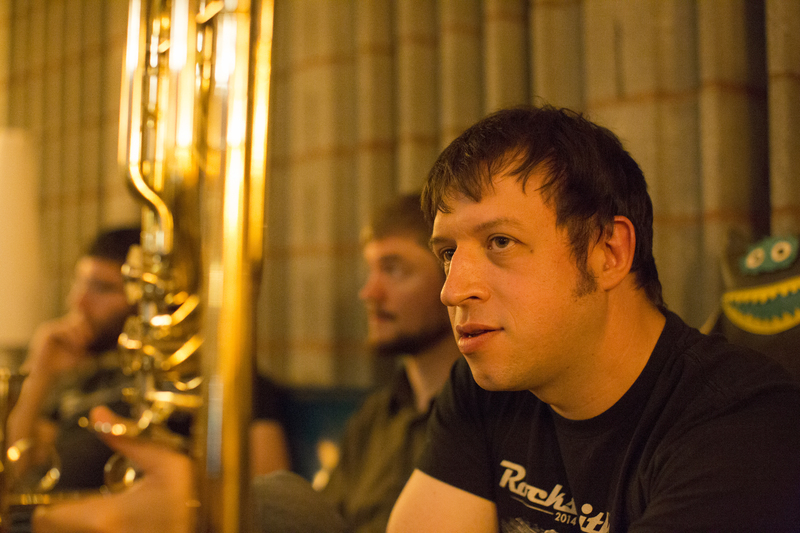 The remainder of the tunes on the album were arranged by co-bandleader and trombonist Lucian Cobb. Have you seen this? Seriously. Going back to that cool cover art idea, once we had the Battle Axe concept, vocalist Laura Windley approached graphic designer and electronic music artist Judson Cowan (aka Tettix) about fleshing out a concept for the cover art. Judson attended East Carolina University with half of the band, and went on to do graphic design work, like designing a blimp for Conan O’Brien and print ads for the Atlanta Braves, electronic music recordings as the artist Tettix, and soundtracks for video games like Rogue Legacy. Judson was perfect for the job because of his knowledge of the nerdy, the cool, the funny, and the music. We think that his instru-weapons are the perfect visual compliment to the pun of our album title. When we met with our recording engineer, Jason Richmond, who recorded and mastered our first album, he made two suggestions that affected the quality of the sound on the recordings and distinguished it from our first album: 1) that we record at Mitch Easter‘s studio, The Fidelitorium, in Kernersville because he thought the studio would be complimentary to our sound as an acoustic band and 2) that we record to analog tape, which would give our recordings that warmer tone of older recordings. 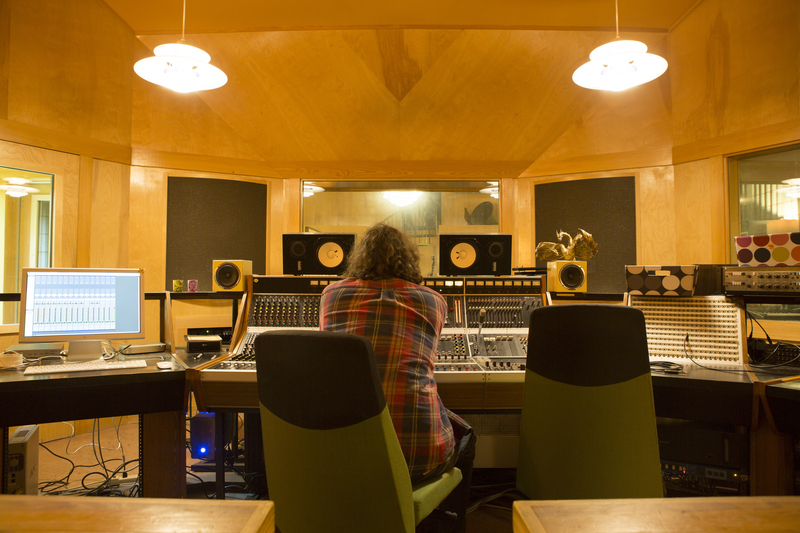 At one of his jobs, Jason happened upon a closet full of unused analog tape that a university was going to throw away and gave to him, so he was excited to work with it in the recording studio and we are very pleased with the results. 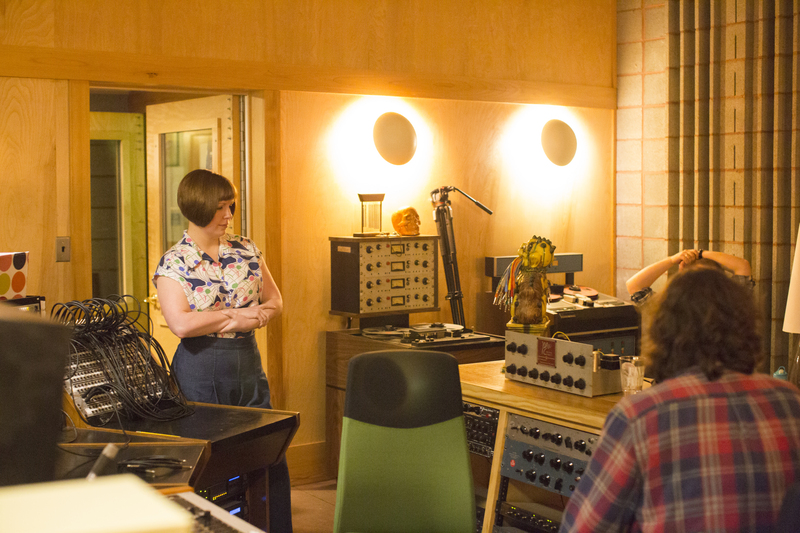 We recorded Battle Axe over a weekend in April at the Fidelitorium and Alexandrea Thomsen, who did our wonderful Kickstarter video and happens to be our guitar player Ben Lassiter’s wife, came out for the Sunday recording session to take photographs. At this point we had recorded most of the tracks for the album and we were doing re-takes on some songs we thought we could do better. The Fidelitorium was a great studio for us, tucked away behind the owner’s home and a “guest house,” which was essentially a little ranch house where the bands stay when they record there. The studio had an open lounge, dining, and kitchen area separate from the recording area and having that space to decompress and take breaks was great. 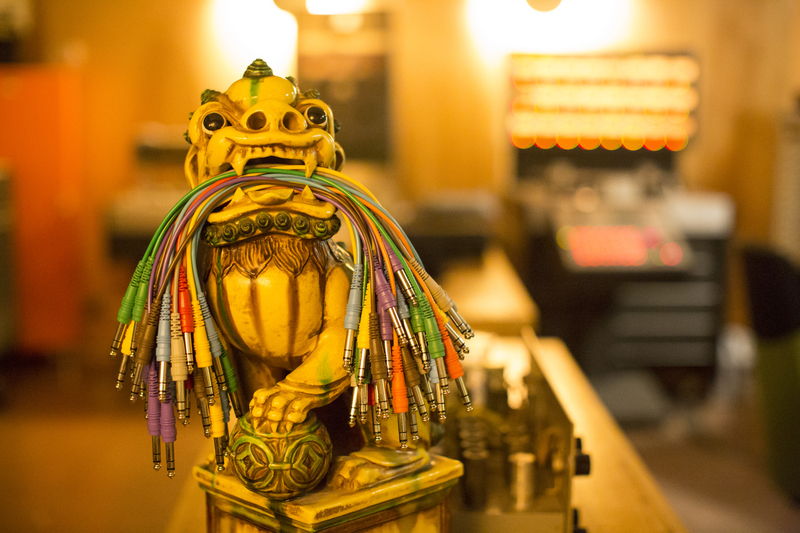 The common area was also full of great artwork, oddities, knick-knacks, and interesting books. 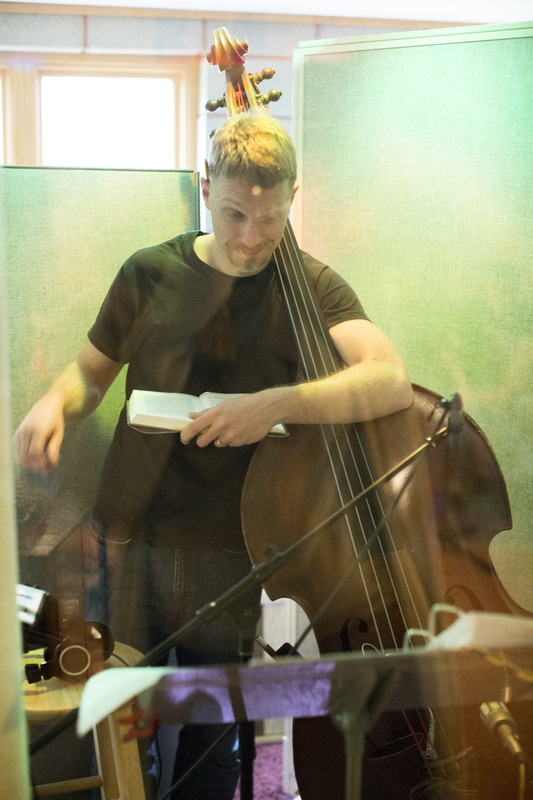 Here are some photos of the recording session for Battle Axe – enjoy! Jason Richmond manning the ground control. 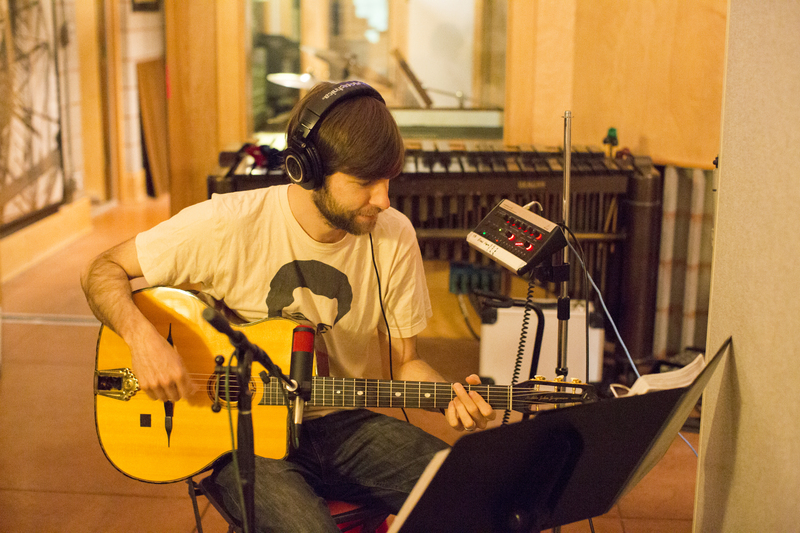 Guitarist Ben Lassiter chunking out that swing rhythm on his axe. 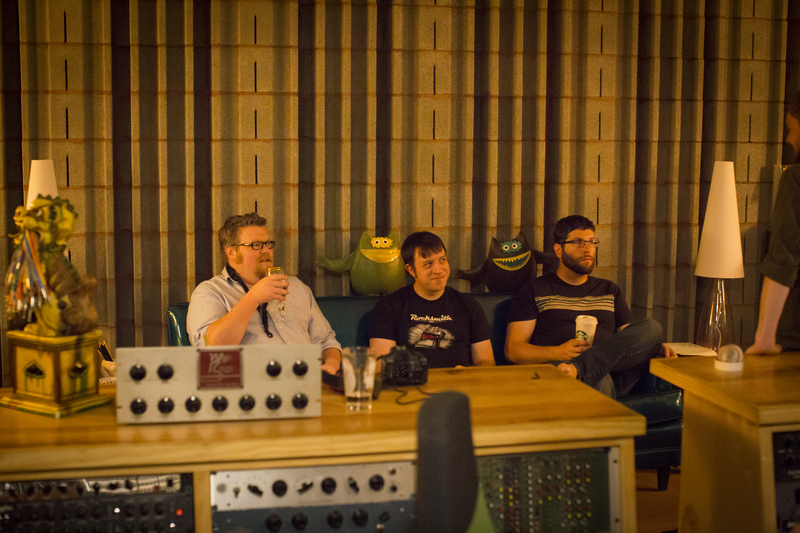 Aaron Hill, Lucian Cobb, and Aaron Tucker taking a break to listen to takes. Take one or take two? Or re-do? Aaron, Keenan, and Lucian listening to takes of Night on Bald Mountain. 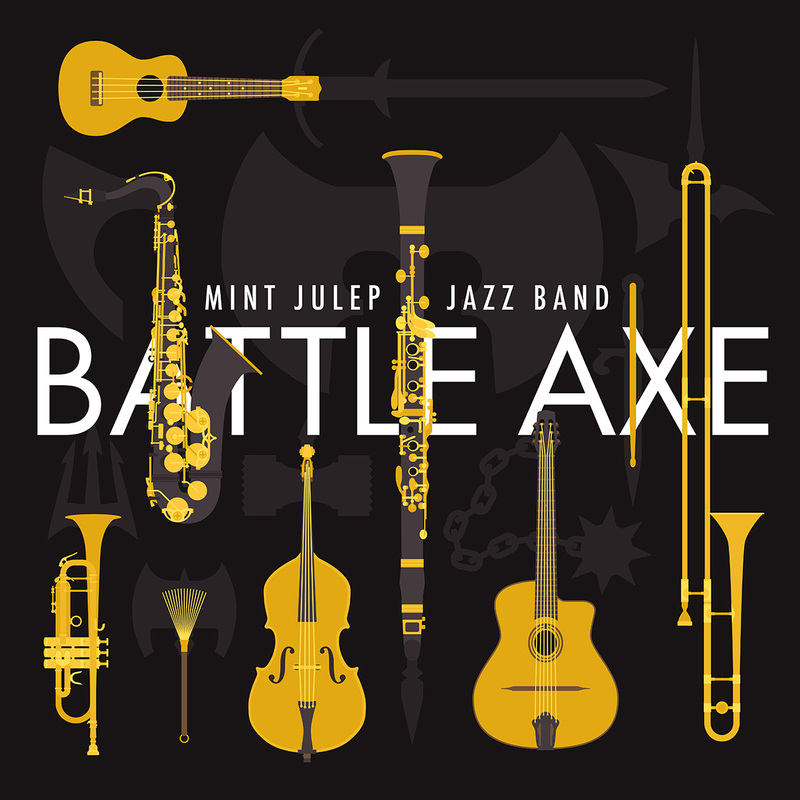 The Mint Julep Jazz Band’s newest album, Battle Axe, is now available online for digital download and for purchase of physical copies of the album! We know for certain that you can find Battle Axe on CD Baby, iTunes, and we suspect that Amazon.com, Spotify, and eMusic will have it as well, maybe even some other sources we don’t suspect! You can purchase physical CDs at CD Baby.com and have them shipped to you or, as always, you can purchase CDs at any of our shows. Some of you have asked which service gives the band the most money per song/copy and that answer is definitely CD Baby, who is our primary distributor. Thanks again to all of our Kickstarter backers for making this dream a reality! New Album “Battle Axe” to Release July 14, 2015! 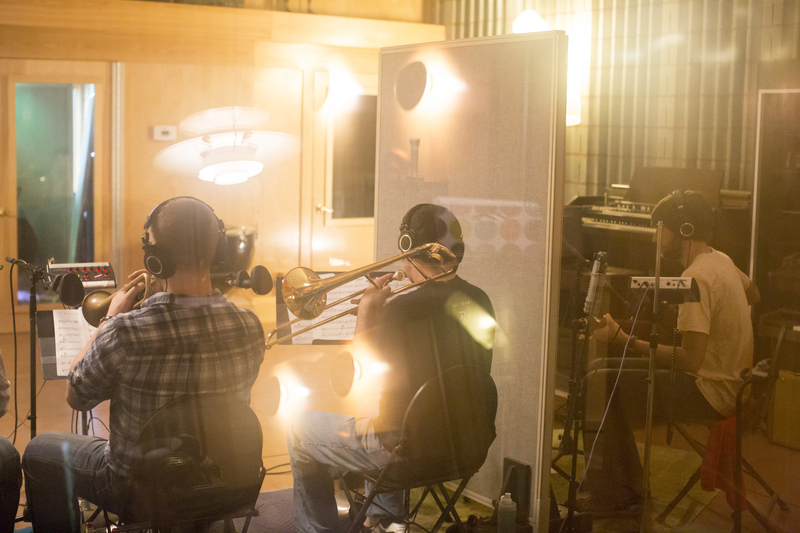 The official release date for digital copies of the Mint Julep Jazz Band’s new album, Battle Axe, is July 14! Digital copies will be available on CD Baby, iTunes, Amazon, Spotify, just about anywhere digital copies are sold. Physical CD copies should be available for purchase online shortly thereafter. Our Kickstarter digital backers will receive theirs slightly before this date and our Kickstarter physical backers should start to receive their copies around this date. Huzzah! Also, check out our fantastic album cover art, thanks to graphic designer and electronic music artist extraordinaire Judson Cowan (aka Tettix)! Just a reminder that the Mint Julep Quintet will not be performing at G2B Restaurant and Brewery during the summer months, but we will resume our monthly performances in September. See you then! Battle Axe Album Kickstarter Backers and Contributors – We Couldn’t Have Done It Without You!